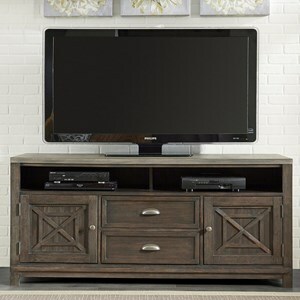 This appealing TV stand offers a country style spot for your TV, DVD player, and other electronics. Quality French and English dovetail construction as well as the oak planked top with pewter end caps shows attention to detail. Pewter knobs accent the glass doors with wood trim and four adjustable shelves within provide plenty of room for components, accessories, and more. Wire management provisions at the back keep cords under control. At the sides, pull out DVD storage at the sides that makes your collection easy to organize and quickly find the movie your want to watch. 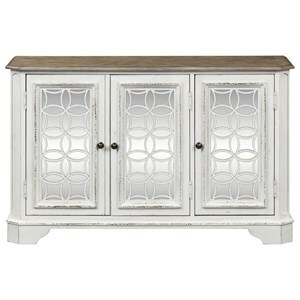 The front of the TV cabinet juts out for appealing breakfront styling to finish the look. 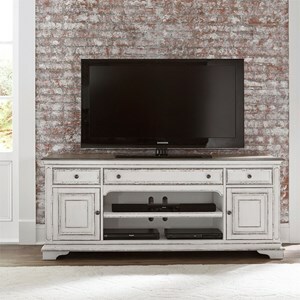 The Cabin Fever TV Console with DVD Pull Out Storage by Liberty Furniture at Godby Home Furnishings in the Noblesville, Carmel, Avon, Indianapolis, Indiana area. Product availability may vary. Contact us for the most current availability on this product. The Cabin Fever collection offers great casual dining furniture and occasional tables for your living room. Appealing details with rustic country charm include oak planked tops, pewter knobs, drawer pulls, and corner endcaps, and tapered block legs with exposed wood joints. 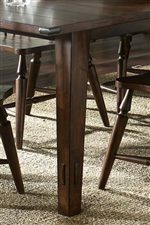 Enjoy the quality construction with select hardwoods and oak veneer tops in a rich Bistro Brown finish that makes your home ready to welcome friends and family into your dining room and living space for entertaining. 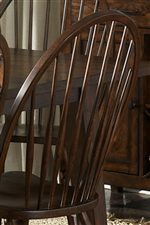 The Cabin Fever collection is a great option if you are looking for furniture in the Noblesville, Carmel, Avon, Indianapolis, Indiana area. Browse other items in the Cabin Fever collection from Godby Home Furnishings in the Noblesville, Carmel, Avon, Indianapolis, Indiana area.